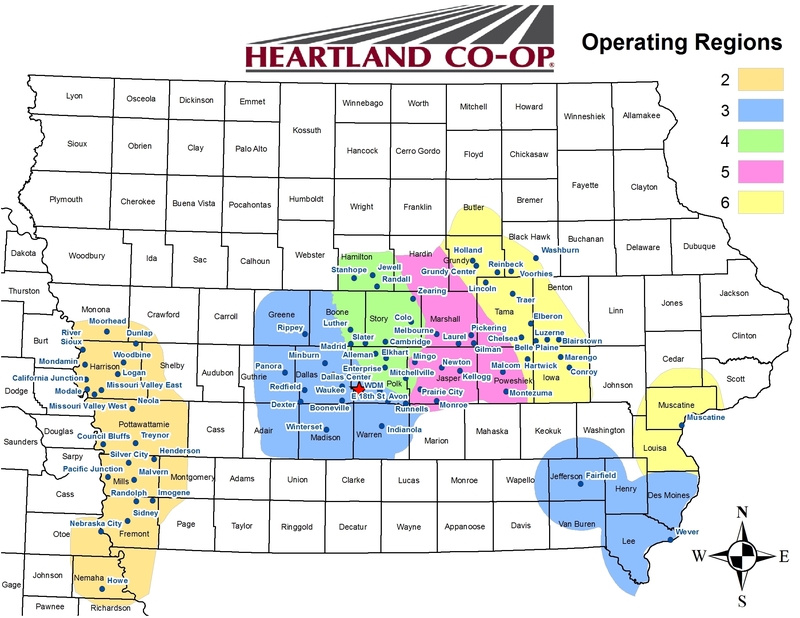 Heartland Co-op is a farmer owned cooperative with over sixty locations throughout Iowa. We provide products and services to local farmers in many commodity and product areas including Grain, Agronomy, Seed, Petroleum and Feed. All of these areas of service require a wide variety of skilled people to assist Heartland Co-op achieve our goals. Heartland Co-op strives to attract, retain, and grow talented employees. We believe that in order to win in our marketplace that we must recruit, develop and retain the most valuable employees available. Heartland Co-op offers a comprehensive benefit package designed to help employees and their families stay healthy, maintain the balance between work and family, as well as plan for their financial future. Chances are we have the perfect employment opportunity for you, whether it is Full-Time, Part-Time or Seasonal employment. Check out our current job openings below, choose the career that is right for you and click on it to apply. Heartland Co-op is an Equal Opportunity Employer EOE/AA committed to advancing diversity in the workplace. To contact us, please email us at Heartland_HR@heartlandcoop.com. This is a General Open Application. Based upon your answers we will direct your application to the appropriate location you are seeking employment with. For a complete listing of all current openings at Heartland Co-op or to apply at a specific location click on "Back to Job Search" link to the right above. Summary: The Sales Associate provides excellent customer service following company policies and procedures and sells products to individuals at the retail store. Applies agricultural chemicals and fertilizer by performing the following duties. Reads and understands label information from manufacturers and distributors of pesticides, fertilizers, and other products containing hazardous chemicals. Evaluates label information to determine that directions for use are followed during application. Applies products in a timely, effective and accurate manner. Converts data from specifications and statements of problems to computer code by performing the following duties. Receives, stores, cares for and distributes grain and other products within the company by performing the following duties. Unloads, cleans, stores, and maintains grain received at the location. Ensures grain quality is maintained during storage process. Moves grain within location, cleans and inspects bins, and loads grain for shipment. Tends feed mill that grind materials such as corn, SBM, ingredients for feed and drugs, by performing the essential job duties. Adds prescribed amount of corn, soybean meal, drugs and feed ingredients for making desired feed. Monitors inventories to ensure proper ingredients are on hand for mixing. Minimizes excess inventory and out of date materials. Drives truck to deliver liquefied petroleum gas cylinders to current customers as well as reach out potential customers to promote cylinder delivery and exchange programs by performing the following duties. Contact current and potential customers to inform them of propane cylinder delivery and exchange programs. Analyze current/potential customers to match program to their needs. Drives tank truck/bobtail to deliver gasoline, fuel oil, lubricating oil, or liquefied petroleum gas to customers by performing the following duties. Contact current and potential customers to inform them of petroleum marketing programs. Analyze current/potential customers to match program to their needs. Promote products and programs in a professional and business like manner. Responsible for sales of agronomy input products and services for Heartland Co-op to production customers by performing the following duties. Make sales calls throughout assigned territory to determine agronomy needs, create solutions and build long term relationships with customers that will generate sales of seed, fertilizer ag chemicals and agronomy services. Directs production, distribution, quality control, and marketing operations for location or assigned territory of Heartland Co-op by performing the following duties personally or through subordinate employees. Coordinates production, distribution, warehousing, and sales in accordance with policies, principles, and procedures established by Heartland Co-op and Regional Manager. Receives, stores, cares for, processes and distributes material, equipment, and products within the company by performing the following duties. Blends fertilizer and chemicals according to label and work order instructions. Examines vehicles and confers with Management to determine malfunction and repairs desired. Refers major vehicle repairs to appropriate management. Removes and replaces parts of ignition system such as spark plugs, points, coil, or alternator to complete tune-up or replace malfunctioning part of system. Must have a sound understanding of the grain industry, excel in sales, and enjoy giving presentations. Meeting and communicating with growers to sell the full range of risk management products as well as originate corn and soybeans. Procure corn and soybeans from producer customers. Calls on producers, explains programs and markets to promote purchases of grain.